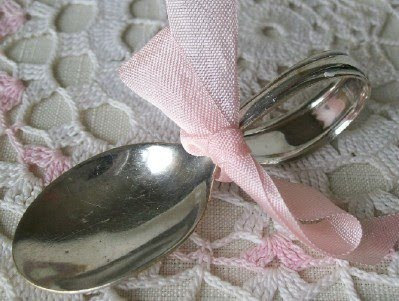 Bella Rosa Antiques: Latest Arrivals: In the Pink! Catherine Klein was known for her gorgeous artwork. This piece of early, turn of the century ephemera is no exception. Note her signature in the lower right hand corner. Sweet little bunnies for Easter time... pink nosies and ears! Impressionistic print of a Parisian lady and her parasol. Say THAT five times fast. Sweet vintage "rose" Verly soap box, made in Germany. Although this holiday is behind us, Valentines never seem to go out of style. I like how the blue ribbon is drawn into the card as though it is woven. Neat details in these old pieces. How about a little mini vanity items in pink? This rouge tin is amazing to me. First, I have never called "blush" rouge...but I guess it is my generation. This little compact tin is still full. And gosh, it is so darn cute! I'm linking up with Pink Saturday. Join in the fun! 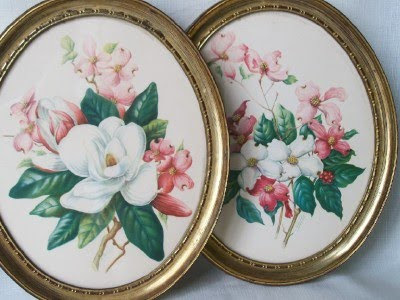 My latest arrivals may be found by going to the Bella Rosa Antiques website here. 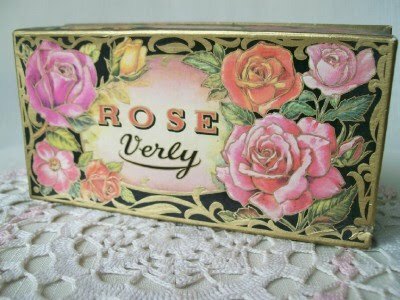 Oh - loving that rose Verly box! What an artist Catherine Klein was! What a beautiful picture. And your bunnies are adorable. I love the pink. 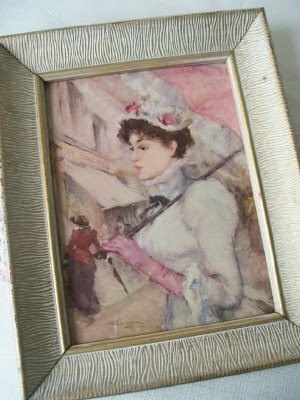 I had a print of the Parisan lady when I was a little girl, hanging in my bedroom. 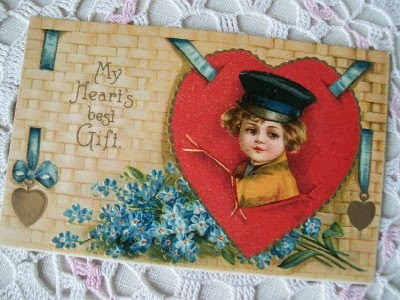 I always loved it.I never grow tired of looking at the vintage valentines! They don't make them like that anymore. Oh wow, I love all your pink!!! 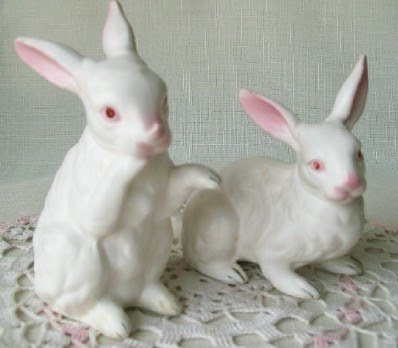 Those bunnies are simply precious!!! 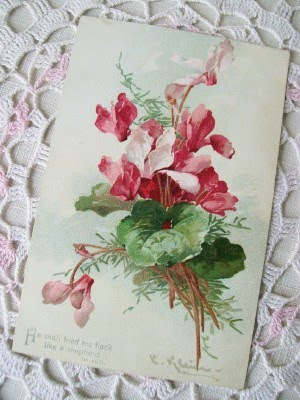 I love the artwork...love flowers! So many pretty pinks! I love the little vanity items. Precious! Happy PS! Love the paintings of Catherine Klein too; a so lovely source of inspiration !! Hi Jillian, Love the Verly soap box. Pink always pops with a bit of black to show it off. Happy PS! I love your vintage rouge container! And the perfume, too. Happy Pink Saturday! I just love all of your pink shares today, especially the vintage soap box, it's gorgeous!!! Oh I just love your pink perfume! They all are very sweet and cute. Such treasures you don't come across often. It was a pleasure seeing all your lovely pinks. You were always Pretty in Pink! Love your pinks. Happy Pink Saturday! Everything looks lovely and in great condition for their ages. Jillian, I am familiar with most of your treasures. I used to sell antiques. I miss it very much but I retired. It is nice to know that you too know and love these lovely things. Beautiful pinks. Hope you have a happy pink week. I love all your sweet pink things...how fun! Hi Jillian! 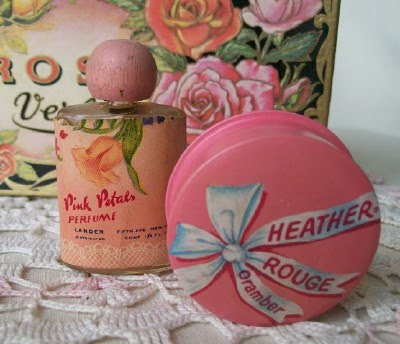 Love your latest PINK vintage items....I ADORE that rouge tin! Hope Spring has sprung in your part of the USA. We had a wonderful day yesterday....I got in a little "run" (actually, a slow jog! ).....SOOO great! I was even hot because our temps were so perfectly warm. Were you able to see the gorgeous perigee moon? We couldn't on the first night, but I did last night...in fact, it's still beautifully huge in our sky right now at 6 something in the morning!